If The Wire ran on television today, one of the characters would probably be an Instagram officer. The San Francisco Police Department has one, and he’s tasked with the unusual job of combing the photo-sharing app for evidence against suspects. It’s not exactly surprising that police forces are actively watching social media. Apps like Instagram and sites like Twitter and Facebook contain a whole genre of photos posted by criminals — from members of ISIS and various gangs to more run-of-the-mill offenders —who just can’t seem to resist bragging about their exploits online. Kwmaine Davis was sent to prison after he posted a selfie at the shooting range with the caption, “Yes, I’m really bout that action” — a big no-no, considering he was on probation. Rapper Leroy Minnis was also arrested for stealing more than $2,000 worth of merchandise from a store in Miami, after he tried to sell some of the shirts he looted on his Instagram account and posted a pic of himself wearing one. 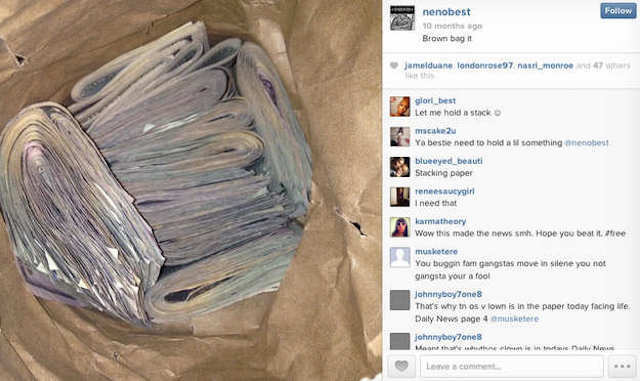 Most notoriously, the New York Police Department made the biggest weapons bust in the city’s history in 2013 after Brooklyn rapper Matthew Best posted photos of guns and cash on Instagram, saying he was selling them in his recording studio. Those photos led police to uncover a multistate illegal gun operation. Cops can use such evidence because of a 2014 Supreme Court ruling in the case of People v. Goldsmith, which said a photograph “need not be supplied by the persons taking the photograph or by a person who witnessed the event” in order to be used in a trial. Instagram itself has a designated Law Enforcement Response Team that answers subpoenas, court orders, and search warrants as they come. But the fact that San Francisco has an unofficial Instagram cop does illustrate the way our online oversharing has become a form of self-surveillance. Today, cops on The Wire wouldn’t be hiding out on the roofs of nearby buildings with cameras to catch drug dealers like Kima Greggs did in the show; they’d just be checking Instagram.